The Sea as well as Space, has enormous potential to provide civilization with large scale energy, so I'm glad to see that the Australian government is supporting Australian company attempting to commercialize sea power. 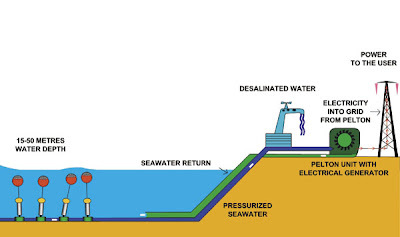 Commercial wave-powered water desalination and electricity generation is one step closer to reality, according to Australian developers. Trials of a technology called CETO have yielded promising results, says Dr Michael Ottaviano of Carnegie Corporation, which is developing the system in the southern hemisphere. The tests, carried out in Fremantle, Western Australia, verify predictions of how much electricity and water the technology could produce under various wave conditions. "We've found a perfect correlation between the results our models predicted and what we've actually measured in the ocean, which is a major technical milestone," Dr Ottaviano said. The CETO technology, first conceived by Perth-based inventor Alan Burns in 1975, consists of submerged buoys connected to seawater pumps fixed to the seabed. As each buoy moves back and forward with the swell, it generates energy to pump seawater onto land at high enough pressures to drive a reverse osmosis desalination plant as well as hydroelectricity turbines. The company has just spent two years developing a computer model of the buoy and pump system, which calculates how much power and water it can deliver back on shore according to different wave conditions. The computational fluid dynamics model uses the same software used to design racing cars and boats for the America's Cup. "We can also now go to any number of sites, measure the wave conditions there, plug those conditions into our models and then tailor a design of the unit to each specific site that we go to," Dr Ottaviano said.